This post isn't just for the parents of boys! Parents of girls, keep reading! 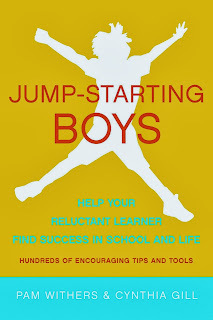 Jump Starting Boys is very readable -- and gives a lot of practical information that we can use right away. Boys seem to lose a lot of interest in reading (and academics) at around age 10. They aren't motivated, and they don't find school relevant. Fact: The more kids read, the better they do in school. But how to get them reading? How to get them comfortable reading? Keep reading aloud to them! Show them that YOU love reading too. Go to the public library weekly (take out lots of books. Let them listen to audiobooks. Let them read books on the computer or tablet. Encourage them to read the SAME book as a friend (or sibling), then encourage them to talk about the book. High Interest/Low Vocabulary books are great to get your child interested in NonFiction. This is one of the best books that I have read about encouraging our reluctant readers to read (not just boys -- girls too). Parents -- we are partners in your child's school experience -- I want to make it the best it can be. If you know that your child has a particular learning style-- let me know. The sooner I know these things, the better I can teach. AND -- if any parents want to start a book club for parents and children (for older children too), have a look at this website -- The Lyceum of Literature and Art. It is a place of learning in Vancouver and it looks fabulous. Does anyone know of anything like this in Toronto? I'd like to hear about it. And I'd like to be part of it! "The Lyceum is a place where literature is transformed into experience and experience is transformed into literature through passionate discourse. In the spirit of the French salons of learning, the Lyceum brings together writers, illustrators, educators and families to share diverse streams of thought through the medium of story - oral, written and visual. "A love of literature is caught, rather than taught." It is easiest to spread literary contagion through books that arouse emotion around challenging social issues. A student who feels an emotional connection to a subject is in the zone of proximal development, ready to become a passionate learner/researcher"